22 new drivers- Mazda Raceway Laguna Seca open track day, weekend event. 9 new drivers- Thompson Speedway open track day, weekday event. 7 new drivers- GingerMan Raceway open track day, weekday event. If you'd like to take advantage of our last minute track specials email list, check out the requirements here and then send us an email. Currently our instructors wanted list has 4,800 subscribers and our workers wanted list has 4,100 subscribers. We've had a few organizations use these lately, one seeking workers for a club race and two looking for HPDE instructors. A handful of volunteers signed up for each of those events- not too bad given the size of these lists and the nature of the work. Send us an email If you want to take advantage of one of these lists and sign up yourself if you want to be added to the list. 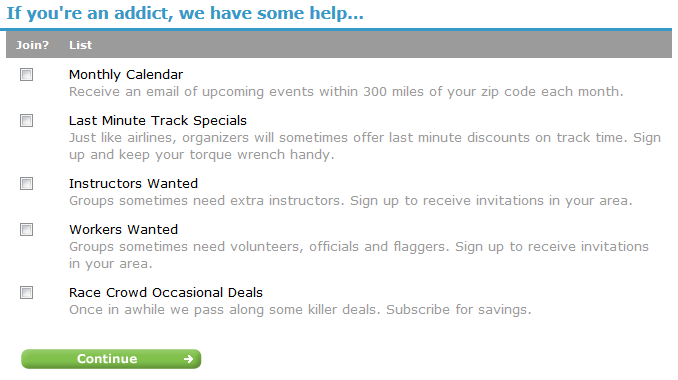 If you're listing your events on MotorsportReg, then you are already taking advantage of this huge email list. We're adding a couple thousand subscribers to this list every month and we're up to 35,500! That's free promotion for your events and you don't have to lift a finger. PS- A few weeks back we got the whole MotorsportReg team together for a week in Wisconsin. And we found a few minutes to take a new group photo- check it out here.